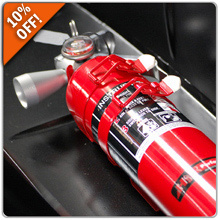 For a limited time, receive 10% Off of the best performing 2.5lb hand-held car extinguisher by H3R Performance! The HG250R model features the clean agent Halotron which effectively extinguishes automobile fires without harming sensitive electronics or vehicle surfaces. The extinguisher includes a mounting bracket for easy installation. Enter promo code FIRE10 during checkout where it says, "Have a Promo Code? Apply it now." CLICK HERE to redeem this offer!